Finishing Consultants specializes in providing the right spray booth design for your unique finishing requirements. We provide the highest quality production spray booths available, and can help you to maximize efficiency in your spray operations. In addition to offering standard spray booth configurations, we also utilize our extensive finishing expertise to help develop custom paint booth fabrications for your specific application. The Finishing Consultants team can even install your new spray booth and provide electrical, fire suppression and other contractor services. Schedule a visit today and start building your spray booth solution today. Spray booths are essential to many commercial, industrial, and manufacturing paint finishing processes. Many painting processes, even those including electrostatic painting and powder coating, all require the use of a properly designed and ventilated booth. 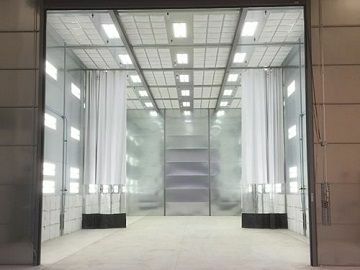 Spray booths are essentially a permanent ventilated enclosure, designed to meet applicable national and local codes, usually installed within a facility, and outfitted with exhaust fans, appropriate lighting fixtures and exhaust particulate filters that collect overspray materials and prevent them from being discharged to the outside atmosphere. 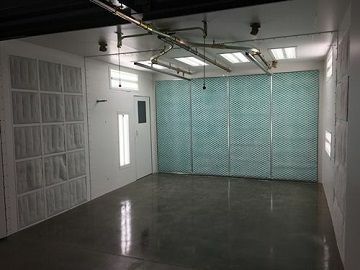 A properly designed spray booth provides a safe environment for the operator and a clean environment for applying coatings, resulting in a proper finish of the parts being processed. Additionally, we can provide gas-fired air make up systems for a pressurized, clean booth environment. All of our booths are designed to meet OSHA, NFPA, UFC, IFC and air quality district requirements.